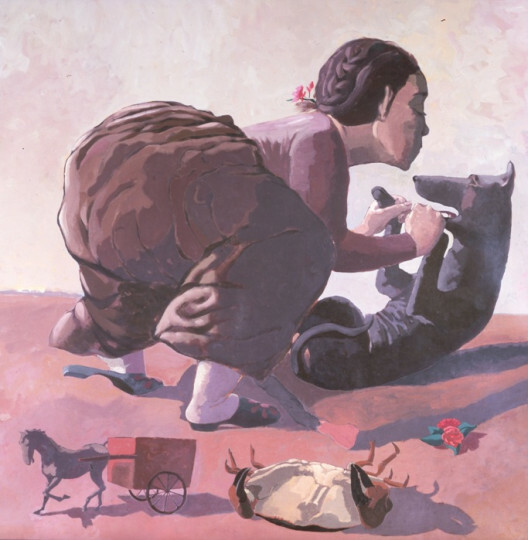 Born in Lisbon in 1935, Paula Rego left Portugal and Salazar’s oppressive dictatorship as an adolescent to study in London where she has now lived for over fifty years. Trained at the Slade School of Arts, she rubbed shoulders with the likes of Francis Bacon, Lucian Freud, Frank Auerbach, and David Hockney. As a painter, she produces large pastel polyptychs with exceptional flair. Obsessed by a certain literature and cultural vision of the 19th century, both realistic and imaginary, like her fellow countryman and film director Manoel de Oliveira, Paula Rego intertwines these references (Jane Eyre, Peter Pan, Daumier, Goya, Lewis Carroll, Hogarth, Ensor, Degas, etc.) with strongly autobiographical elements and elements of real life, that of the contemporary world and its social and political issues, with a contemporary twist. Dark narratives, her paintings seem to be taken from a cruel tale and evoke women's issues in strange scenes, going against social codes. "My favourite themes are power games and hierarchies. I always want to turn things on their heads, to upset the established order, to change heroines and idiots". In this aspect, Paula Rego’s ideas reflect those of Hogarth, Goya and Grosz, questioning established conventions and revealing with irony the traits of bourgeois society embodied by family, religion and the State.